The Futura has always been known for its high cost-effectiveness, a requirement the new type also satisfies. With its exceptionally low net weight, aerodynamic finish and economical DAF drivelines, the New Futura raises the bar in terms of fuel consumption and emissions. At the same time, the Futura impresses with its soundness and reliability. Only proven technologies are used in the vehicle. The automatic AS Tronic transmission provides smooth shifting, easing the driver’s task. The modern electronic brake system (EBS) is equipped with a brake assistant. Furthermore, the Futura is fitted with the ESC stability program, which helps the driver maintain control of the vehicle during difficult manoeuvres and prevents roll-overs. A new coach with a familiar name The New VDL Futura makes its international debut with a complete range of offerings: the basic models are 2-axle high deck coaches with lengths of 12.2 and 12.9 metres, which with various seating arrangements can accommodate up to 57 passengers. A trio of 3-axle Futura models with lengths of 13.1 to 14.8 metres round off the series. In terms of style, there is no doubt that the Futura is a descendant of the VDL family. The coach has a business-like, modern appearance, without unnecessary excess. The emphasis lies primarily on the aerodynamic front with the large VDL logo and the arrow-shaped headlamps. The horizontal lines of the side walls clearly divide the body surfaces into the functional segments for the passenger compartment, baggage space and engine compartment. The Futura has a completely unique and elegant look, and the design is both aerodynamic and coach wash friendly. Also deserving of special attention is the distinguished looking rear end with a characteristic form that reduces the low pressure area behind the coach – form follows function. The passenger compartment exudes a feeling of spaciousness and has a flat floor without any raised areas. The newly developed generation of seats indulges the passengers with custom comfort: the Class 100/300/500 models offer the customer a suitable seat for every deployment area and range from a basic model to a richly appointed luxury seat. If desired, the Futura can be delivered in a 2 + 1 configuration that meets the most demanding requirements. For the climate control, use is made of a proven air conditioning unit that does its work without creating drafts and is virtually silent. The Futura is one of the most silent coaches in its market. Noise from the driveline and road are carefully dampened. VDL Class 500 seatsFamiliar good characteristics: powerful engines and safe designs For the drive system, VDL Bus & Coach continues to depend on powerful six cylinder inline engines from DAF. For the 2-axle models, the Euro 5 or EEV engines from the PR and MX series are the first choice. With their 361 and 410 hp, they provide high performance in combination with low fuel consumption. The most powerful engine, rated at 460 hp, is reserved for the 3-axle high deck models and with 2,300 Nm of torque provides convincing power even at low rpm. The automatic AS Tronic transmission eases the driver’s job and selects the right gear in any situation, while the exceptionally quiet ZF rear axle ensures optimal engine speeds thanks to gear ratios that are perfectly matched to practical driving situations. (electronically controlled air suspension), the Futura possesses superior road-handling capabilities. With the stabiliser at the rear axle that resists torquing around the vertical axis, the Futura also presents itself as an extremely comfortable coach that makes travelling a pleasure. The EBS brake system satisfies the most demanding requirements: with disc brakes all round and the brake assistant, the service brake can handle any traffic situation. During an emergency the ESC electronic stability program employs independent braking of the individual wheels to prevent the vehicle from skidding or tipping. New cockpit with top-level automotive quality For the driver of the New Futura, the new cockpit is a true pleasure. Major plus-points are the luxurious driver’s seat with large adjustment range and the adjustable steering wheel. The attractive, single piece, two-colour dashboard is an exceptionally high-quality construction. The right side tapers off to give the driver a good view of the area outside the front right corner of the coach. 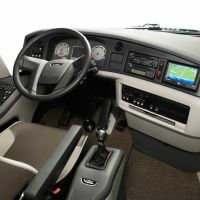 The ergonomic operating concept for the driver’s workplace has been completely redeveloped, ensuring that all control elements and switches are easily accessible. Naturally the Futura is also equipped with a separate climate control system for the driver’s area and passenger compartment. The tour guide has a comfortable sitting area with ample storage space and all the control elements at hand’s reach. The first Futura models are currently in production at the Dutch factory in Valkenswaard where they are being built with an advanced manufacturing method. Special modules, including entire vehicle platforms, side walls, roofs and front modules, come off the assembly line in complete, pre- assembled form. Last but not least, a few words about the durability: the Futura will remain impervious to corrosion for many years, since virtually all the steel components are made of stainless steel. Only proven technologies and components are used – the collective know-how amassed by the VDL Bus & Coach subsidiaries over many decades all flows together during production of the New Futura.